The VBurst by Optima Graphics is a remarkably ingenious idea in the advancement of pop up displays allowing the dye sublimation fabric skin that’s mounted onto the hubs of the frame, to pack with the frame when the pop up frame is collapsed and when opened, to stretch out to create a large format graphic that offers a degree of simplicity in pop up displays that had never been thought of before. Available in 5’, 6’, and 8’ models, the VBurst even comes with the graphics covering the ends to finish off your presentation and set up or tear down in record time. Take a look at all the great trade show booths from Optima. Optima Graphics is a principal purveyor of trade show display graphics who provides services and products more uniquely than most vendors. What does Optima do? first and foremost, they understand your needs as a individual and as a business to business partner, and when accompanied with a long term business plan, helps diminish the immediate challenges. Their goal in the marketplace is to be the leading supplier, and to achieve that goal through outstanding service and careful execution of product delivery with the customer/business partner relationship, always in mind. They have an capability to consistently deliver above and beyond through great planning, providing information on present issues, and a consistent flow of new products for the future. Years ago, it was Optimas' bold move into the Lambda printing technology which is used in photo murals for pop up displays, that really got everyone's attention in the exhibit industry. One of the many wonderful technologies that they’ve utilized that we take for granted, are dye sublimation products that are used with the VBurst display, which has revolutionized and revitalized the pop up displays segment of the market. Nobody else in the trade show exhibit industry has had a positive effect like Optima has. 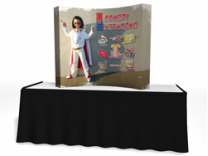 ShopForExhibits, a nationwide distributor of trade show displays, is expanding their online product offering with display booths in the rapidly growing tension fabric displays category. In order to support the business expansion which they forecast for the future, SFE has recently gone live with a new web site that provides an enhanced level of client support in the way of video demos and enhanced product information. Although the future is anything but certain in this day and age, great new products and reasonable pricing will be most important in order to conquer the challenges ahead. Not every business will succeed in successfully bringing new products such as tension fabric displays, to market via the internet, but ShopForExhibits has positioned themselves in a positive manor through their industry and product experience, and on line communication skills, to have the best results in this most competitive industry.